THIS REVIEW ASSUMES THAT YOU HAVE SEEN THE FILM AND IT’S FILLED WITH SPOILERS. IF YOU HAVEN’T SEEN THE FILM YOU SHOULD NOT READ IT, BUT YOU SHOULD GO OUT RIGHT NOW AND BUY YOURSELF A COPY ON DVD OR BLURAY !! So much has been written and talked about this movie that it’s hard to say anything new about it. However I didn’t want to miss my chance to talk about what I thought was one of the most inventive and challenging blockbuster of the last few years (and the top film of the year in my view), and with its release on DVD and BluRay (I guess the first of many), to the risk of repeating what’s already been said, I’ll just add my voice to the many others among the people who loved this film. I have already seen it three times and I guess I am now fully comfortable with its story and structure, but also I did notice the few cracks here and there. However, it is so refreshing to finally see a big budget Hollywood movie that doesn’t treat its audience like a band of lobotomized idiots but actually attempts to do something a bit more challenging, beyond the silly Pirates of the Caribbean or the awful Transformers movies, but it seems to me that this is what blockbusters have become in the last few years. I honestly cannot remember what’s the last big Pop Corn summer movie I have enjoyed. Can anyone help? This film makes no apologies for its labyrinthine structure and it’s as if you could almost hear Nolan saying to me “c’mon, keep up! Keep up!”. It is a mentally draining experience (I don’t think I have been so exhausted since Nolan’s Memento, which I loved, or even Mullholland Drive, which I’m still trying to work out… ). Basically in this film if you miss even 5 minutes, you’re screwed! And I love it for it! But the most interesting thing I noticed this time is that the film is actually made in such a way that even if you don’t completely understand it, you’ll understand it enough to be able to appreciate the action and the basic plot with its intricate layers of dreams. You’re supposed to get lost in the beginning, but never lost enough to lose your patience… and then slowly you start to understand just enough to be able to cope with it… So basically, the film makes you believe that you are pretty clever in being able to work it out by yourself, while in fact the huge amount of exposition helps you immensely. People have been criticizing the fact that half of the movie is essentially exposition, where the characters are telling you what’s going on and what they are going to do and how… Well, funnily enough I though that was part of the fun. I don’t mind exposition, if it’s done in a clever, fast and intriguing way like in Inception. People have been criticize it for its cool and clinical approach to characters. I have been hearing people complaining about not feeling anything for Di Caprio’s internal pain. Well, I don’t know what to tell them about that, but I thought the scene where Marion Cotillard commits suicide was actually emotionally incredibly strong and Di Caprio’s performance was pretty faultless. Yes, maybe Ellen Page’s character was just a functional piece of the puzzle but actually pretty two-dimensional, but hey, does it really matter? Was I sitting there thinking “Oh My God, what is she feeling? I want to know more about her?” No!! I was completely unwrapped in the story to notice any of that and it didn’t matter to me. Marion Cottilard is utterly terrifying as the ever-present ex-wife. Just her presence is enough for me to give me a great sense of unease. She’s perfect in it and she’s quickly becoming my favorite French actress. Cillian Murphy in his character manages to convey both strength and weakness: at the beginning you think he’s got the world in his hands and at the end you almost feel pity for him and you understand his pain. Joseph Gordon-Levitt is incredibly watchable. Surely it must not be too easy to be next to Di Caprio and come out just as strong and sympathetic as he does. We’ll be hearing a lot about him (but then again, I was already a fan from the time he did “Mysterious Skin”). Tom Hardy is the surprise of the film. I knew what to expect by all the other ones, but Hardy really took me by surprise and did so much with what was quite an underdeveloped character, making him likable, sharp and witty. Finally I should probably mention Michael Caine, who does almost nothing in this film, and yet, just by the fact that he’s there he gives me a sense of security and serenity that it’s un-replaceable. Also the visuals obviously are so stunning that you sort of want to forgive even any little character development. The CGI effects in Paris are some of the best ones and most inventive I have seen in recent times. It is so hard nowadays to still be able to amaze us with any Visual Effects and yet Nolan has been able to do it over and over again in this film. It’s the combination of clever Production Design, imaginative Visual (and most of the time Practical) Effects that make it work seamlessly. The corridor sequences are just a joy to watch and the cross-cutting between the van falling off the bridge in slow motion and all the other levels is just so pleasing and works so well: it’s intricate and yet so simple at the same time, so much so that you wonder why hasn’t anyone done it before? Where the film falls a bit is in the final act, the so-called “James Bond moment”, that is when we get to the level with all the snow. Maybe because at that point it becomes in part almost like a normal action film, and actually not a very good one either. The staging of the shootout and the chase sequences on the snow are all pretty average and slightly drawn out. Mind you at that point there are so many other things going on and you’ve been so bombarded by so much that you don’t really mind it too much, but it is the weakest part of the film in my view. Also in a way, since you are in a dream, they should have probably pushed it a bit further. But hey, I’m really picking needles here. 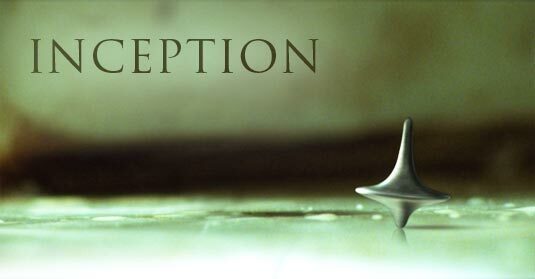 I wish all the blockbusters were just 20% as inventive, challenging and beautiful to look at as Inception was. I can’t wait to see what Nolan does next (well of course, Batman 3… but I mean beyond that). It’s a great film. I reckon it’s quite possibly the best of the year so far. Speaking of the BluRay and DVD, did you pick up the collector’s edition with the little suitcase and spinning top? It seems like mine has been in the post forever. And you just know it will end up dented. Why SHOULDN’T we feel pity for Cillian Murphy’s character? He’s done absolutely nothing wrong, and Cobb and his gang of thugs subject him to a most horrifying mental violation that is apt to have awful repercussions for his business, his employees, and his customers worldwide. If Nolan were a better writer, and not just a very average writer with a knack for ripping off Ridley Scott (by his own admission) and classic Bond films, “Inception” would be a horror story with Murphy’s Robert Fischer as the protagonist. As it stands, taken at face value, the film has no protagonist: it has criminals (Cobb and his paper-flat ghouls), and it has a victim (Fischer). Trying to make Saito seem sympathetic by wounding him early on is the cheapest of ploys. Such an amazing film. I loved it from start to finish. The special FX were just AWESOME! I really liked the musical score and feel it deserves some attention also. Also, I’m trying to stop the discussion on that damn spinning top at the end of the movie.